What is advent and why do we celebrate it as part of the church year? 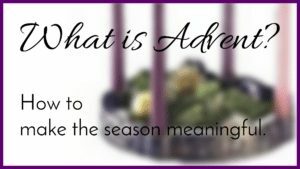 What does the word Advent mean? Advent is the season of the church year when we prepare our hearts and minds to celebrate Christmas. Advent has 4 weeks, and technically continues past Christmas on December 25, when we celebrate Jesus birth, and to Epiphany (the visit of the wise men) on January 6. The word “Advent” is derived from the Latin word for “coming”. We reflect on Jesus’ coming at Christmas and also prepare for when Jesus comes again on the Last Day. The two words I think of most when I consider Advent are “come” and “prepare”. During the season of Advent, we reflect on Jesus coming. It always seemed a bit strange to me to spend the month of December in church talking about Jesus coming, as if we were waiting for it, when we know he already came as a baby at Christmas. Yet this is the remembering part of Advent. Each year, we reflect back on the life of Jesus and all that he did for us. Fully God, he was and is perfect in every way. Jesus became fully human in the form of a baby, then suffered and died on the cross to pay the penalty for our sins so that we can have eternal life with him in heaven someday. This is our most amazing gift. We prepare. Yes, during Advent we prepare our hearts for Christmas. Just as important, we prepare for when Christ will come again on the Last Day, the judgement day spoke about in Revelation and other parts of the Bible. Whether that is after we die or while we are still alive, that is an important day for all people. We hope all people will know Jesus and come to the knowledge of the truth. (1 Timothy 2:4). So we can say the coming of Christ has 3 parts — past, present, and future. Christ came as a baby to Bethlehem. He comes to us today through his Word and Sacraments (baptism and Holy Communion), and we look forward to his coming again on the Last Day. What Are Ways to Celebrate Advent? Here are some meaningful ways to celebrate Advent. Many mainline churches have worship services during the week during the Advent seasons, in addition to Sundays. These worship services are a wonderful way to step aside from the Christmas hustle and focus on the true meaning of the Christmas season — the baby born in Bethlehem who is the Savior of the world. 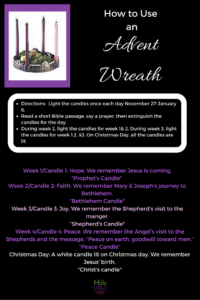 An advent wreath is a another way to honor the Advent season in your home. Many churches have them, and you can purchase one of your own and use it every day with your family. We have one at our house at part of our Christmas decorations and keep it set up on our dining room table. We use it during our family devotion time and the kids take turns lighting and putting out the candles. The tradition of using an advent wreath dates back to Germany even before the Reformation. We use a white candle in the center of our Advent wreath as the Christ Candle. This is lit on Christmas day in remembrance of the coming of the Christ child. In some traditions, this is lit during the 12 days of Christmas. 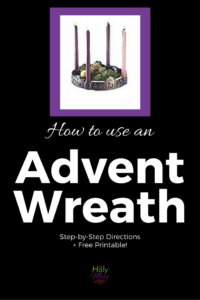 I created this graphic with directions for how to use an Advent wreath, and included an printable version which you can print here for free. Many people have a short Bible reading or devotion every day during the month of December, especially one that specifically prepares our hearts for Christmas. Here are a few possible resources. If you know of other good ones, please post them in the comments below. 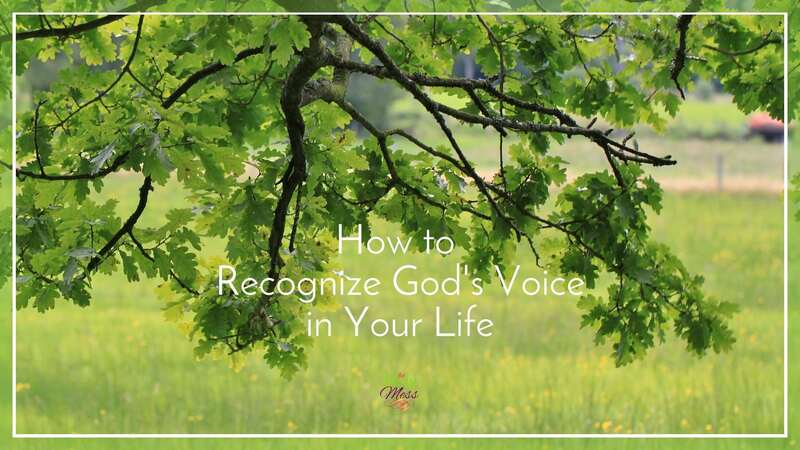 Meaningful devotion resources for adults for Advent. 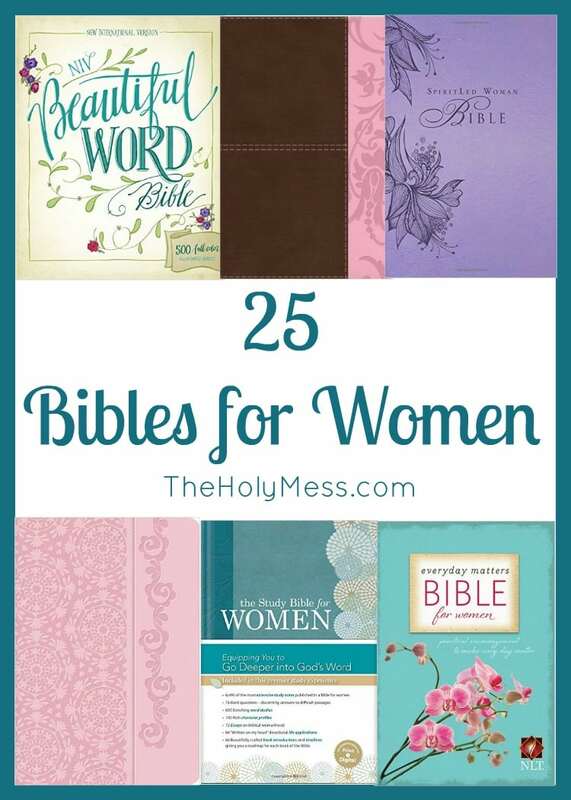 Here are some great devotional resources for children. An advent calendar is a similar way to count down the days until Christmas. There are secular and Christian versions available, but I especially enjoy ones that remind me of the birth of Jesus and help me encourage my children to keep in mind the true reason for the season of Christmas. An advent calendar can be a little chocolate to open each day, a small gift, or a symbol like a present to put on a tree or another piece of the nativity to put on the set. There are all types of advent calendars now, even this Lego advent calendar my kids have had their eye on. If you are looking for a Christian alternative to Elf on the Shelf (although we do Elf on the Shelf and have a lot of fun with it — and that’s okay, too), check out this Star From Afar . I love this concept for a reverse Advent calendar. Get a box and every day during the month of December, put in an item to donate to a food pantry. On Christmas Day you’ll have a full box to take. What is Advent? — good video! Unwrapping the Gifts — Worship resources. 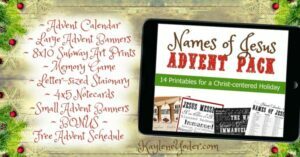 Includes free devotions and kids bulletin inserts. How will you honor Advent this year? Success! Important: Check your email to confirm and get your free download. 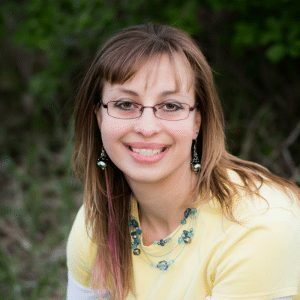 Sara is a speaker, writer & mom to 5 amazing kids by birth and special needs adoption. Click here to read Sara's amazing 100 pound weight loss story. Feel free to send Sara a message here. Nancy, Thanks for the resource! To clarify, I see the podcast in the link, but where can we get the book? 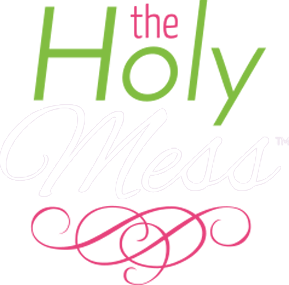 Welcome to The Holy Mess. I love helping women find balance in busy lives for faith, family, & fitness. Read more about my 100 pound weight loss story here. Mostly I’m a real wife and super real mom. Feel free to contact me by clicking here. Click here to visit our Christian weight loss program. This website contains affiliate links. Please see my disclosure page for additional details. I am a participant in the Amazon Services LLC Associates Program, an affiliate advertising program designed to provide a means for sites to earn advertising fees by advertising and linking to Amazon.com.